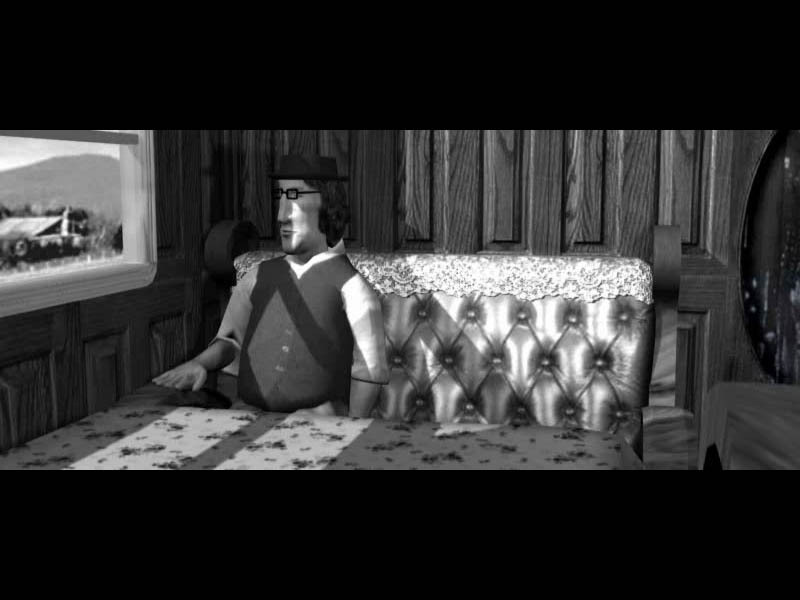 Edgar sat in the compartment alone, deep in thought as the train drew closer to Montreal. Why had his parents been so adamant about him moving to the big city? Why couldn’t he remain in his familiar and comfortable hometown? He had just graduated from college. He was naïve and inexperienced. What kind of work could he hope to find? Was he going to make it in Montreal? 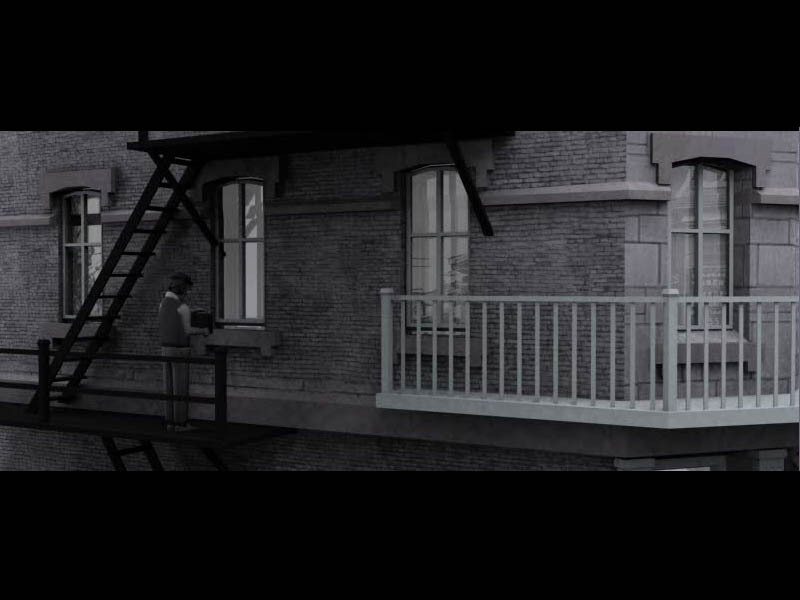 Upon arriving at the city, Edgar made his way to his uncle’s apartment. It had a single room. Edgar was going to have to share a community bathroom with the other tenants. The creepy landlady seemed to have made a habit of spying on the residents. But it was still a place to stay. It would have to do for now. Sitting on his bed, Edgar flipped through the pages of the newspaper. A curious employment ad caught his attention. The advertisers were looking for someone that had a knack for research. Knowledge of weaponry was considered a plus. Having been a student of history, Edgar considered himself to be more than qualified for the job. The fact that he had no idea what he would actually be doing was just a minor detail. A quick phone call got Edgar an interview. By the time he understood that the position was for a private investigator, Edgar was already hired. Evidently, as far as his new employer Gaspard Lemaitre was concerned, lack of experience and training was of no significance. After the briefest introduction to the world of private investigation, Edgar was given his first assignments. Carte Blanche: For a Fistful of Teeth is the first episode of an adventure game series from Absurdus. 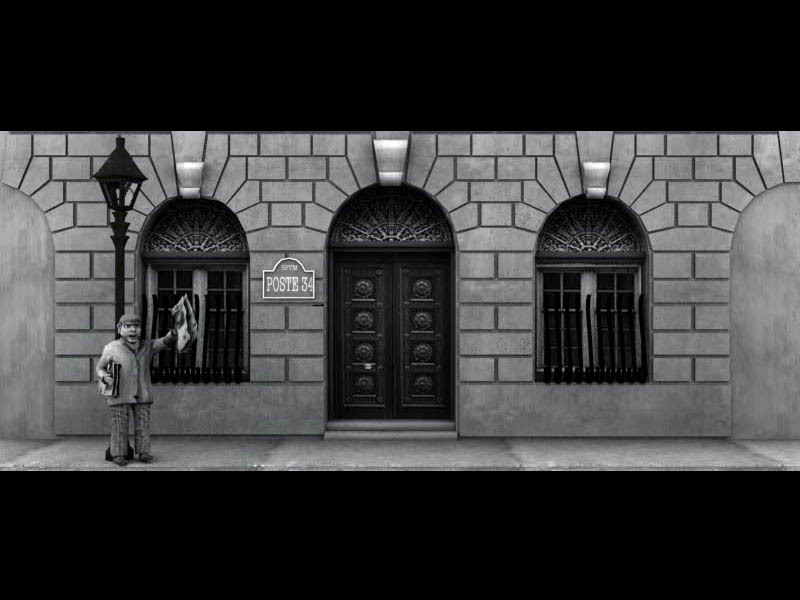 True to the development company’s name, For a Fistful of Teeth is an off-the-wall adventure game that delivers a series of obscenities while attempting to invoke a film noir atmosphere. The game does have a series of problems and its style will not appeal to all gamers, but if you are looking for a somewhat unusual adventure gaming experience, Carte Blanche certainly delivers. 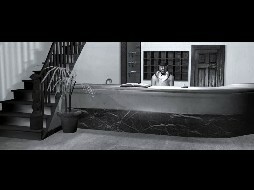 The game begins as Edgar arrives in Montreal and finds a job as a private investigator. As he does not have any experience in detective work, Edgar will initially be assigned a couple of seemingly simple cases to investigate. However, this being a video game and knowing that players having a tendency to get bored while performing mundane tasks, events will quickly escalate. Edgar will find himself responsible for a lot more than what he originally anticipates. The storyline will not exactly keep you on the edge of your seat or give you an adrenaline rush. The game does not weave an intricate plot that will keep you guessing until you reach the end of the episode. However, the storyline does have a few twists and turns, stepping outside the initial premise. More importantly, the first episode drops hints about the bigger plot and sets the scene for the rest of the series. It may be interesting to discover where Edgar’s journey will lead him as future episodes are released. 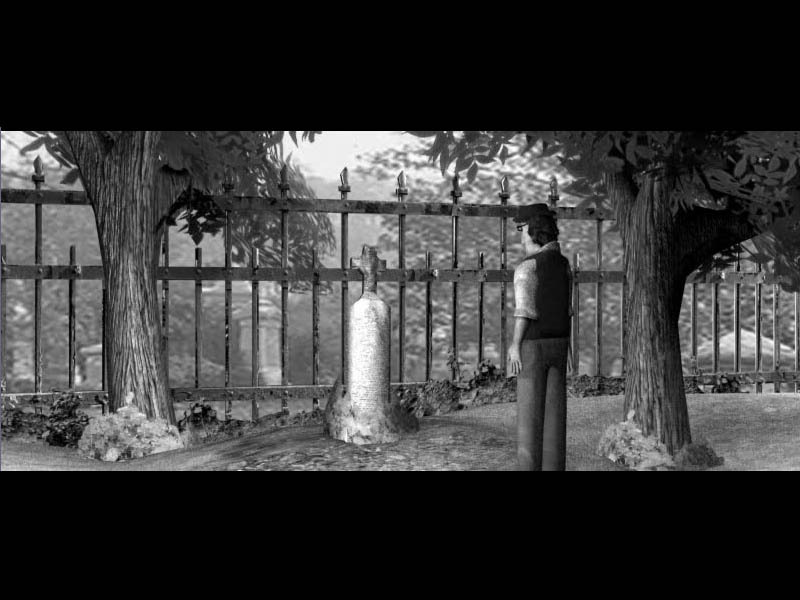 One of the key elements that set Carte Blanche apart from many other adventure games is the overall atmosphere. While it has a humorous theme, For a Fistful of Teeth is not your average comedy adventure. Many of the situations are purposefully over the top. The dialogue often feels strange and there is something odd about each character you encounter. 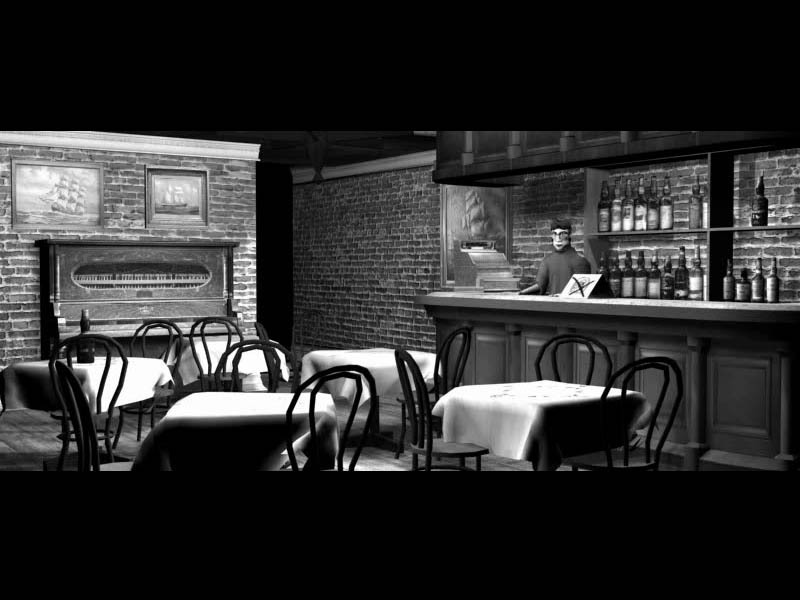 Throw in black and white graphics and put it all against the backdrop of a corrupt city in the 1920’s and you have one weird game. To a certain extent, For a Fistful of Teeth manages to make the atmosphere and the setting work, delivering a few humorous moments. But the oddness of the events and the characters can also leave you confused and unable to relate to what is happening in the game. It is hard to appreciate some of the jokes as they just don’t seem to hit the right tone. At times the game feels like an inside joke among the development team that players may never fully comprehend. It doesn’t help matters that the dialogue is not always written in the most effective format. Some of the interaction feels awkward beyond the intentional feeling of absurdity the developers tried to create. The voice acting also seems to miss the mark on many occasions, diminishing the believability of the characters. In addition to its unusual tone and atmosphere, Carte Blanche attempts to distinguish itself by incorporating a skill system into the game. 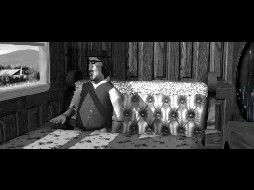 As you proceed through the adventure, Edgar will acquire and develop skills based on key conversations and events. For instance, one of his employer’s friends will introduce Edgar to the art of the scam. He will also have a chance to learn the basics of ventriloquism. Once Edgar acquires a skill, he will have various opportunities to practice it on different characters or objects. Each time you successfully use a skill, Edgar’s proficiency will improve. As such, it is possible for Edgar to become quite adept at using some of his newly acquired talents. It can seem as though the skills introduce an unnecessary level of complexity to the game. To a certain extent, the developers have managed to keep things simple enough where this feature is enjoyable. However, repeatedly practicing the same skills on different characters for no apparent reason does become tedious. The comical results of Edgar’s attempts aren’t always enough to make up for this tedium. 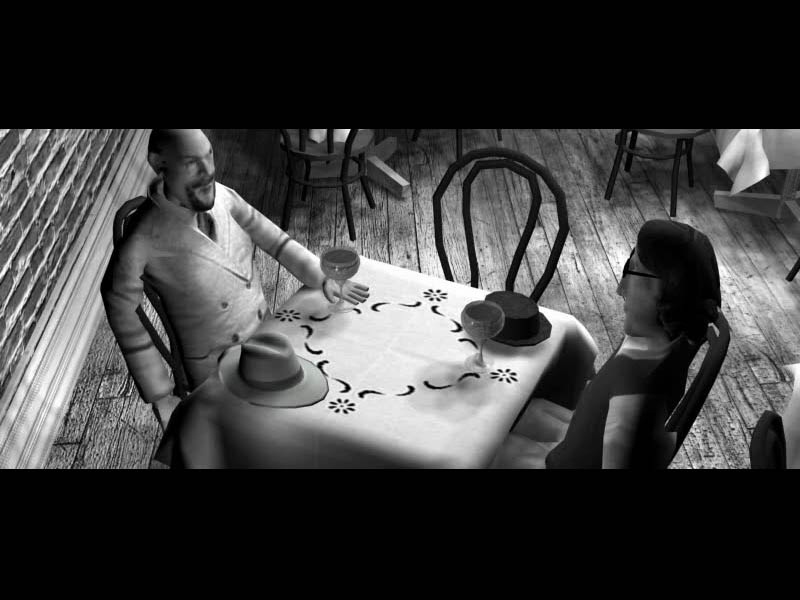 Fortunately, the proficiency level required to overcome many of Edgar’s challenges should not be difficult to attain, often coming naturally through interactions during the regular course of the storyline. Despite some problems, the skill system adds a welcome level of depth to Carte Blanche. Trying to improve Edgar’s talents can even become something of a fun side-quest. All your hard work in teaching Edgar some new tricks will not be wasted either. Once you complete the game, it is possible to make a save file that can transfer your ratings to future episodes of the game. Players interact with the game primarily through the mouse. 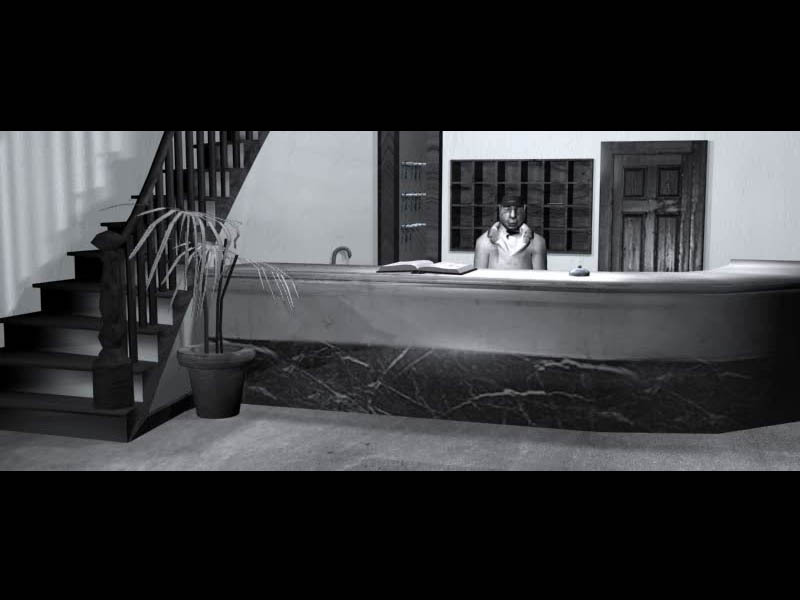 Depending on the scene you are viewing, For a Fistful of Teeth alternates between first and third person camera. Labels describing objects of interest appear as you drag the mouse over them. A left click on the object brings up a context-sensitive menu listing all the possible actions Edgar can attempt. A left click on the menu items instructs Edgar to perform the indicated action. A right click brings up a screen resembling a file folder. This view is used for saving and loading the game or taking a look at the items in Edgar’s inventory. Unlike many other adventure games, players do not have the option to select items from inventory and attempt to use them on other objects. Instead, items appear as possible actions Edgar can perform when you click on the appropriate objects in the environment. This prevents players from resorting to using every single item on every object when they are feeling stuck. Edgar’s investigation takes him to various locations throughout Montreal. Each time you leave a place, a map of the city will be displayed. All the available places Edgar can visit are displayed on this map. A single click takes Edgar to his destination. For the most part, individual locations are small, often consisting of a single room. While it may feel like you are not thoroughly exploring each of the available locations, this structure does make it easy to return to each site and look for items of interest you may have missed on your first visit. 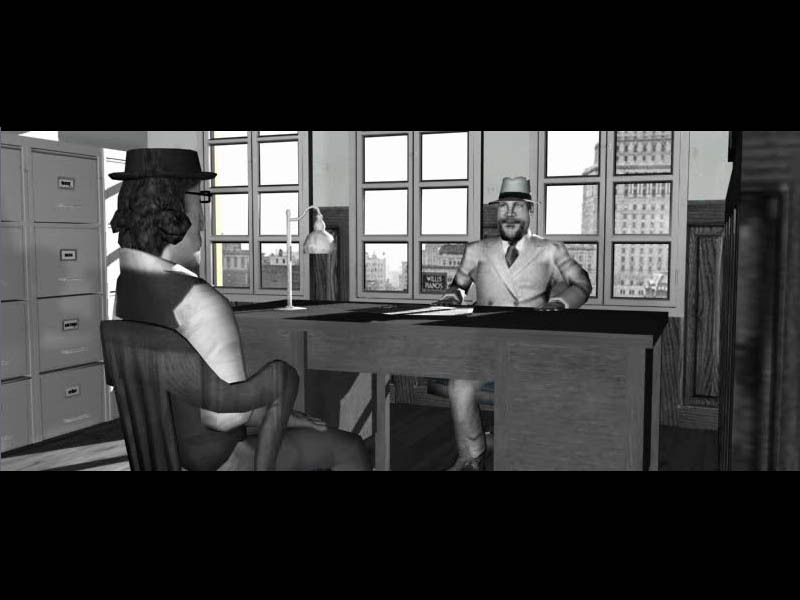 Much of the progression of your investigation will be based on conversations with the game’s characters. There are a relatively limited number of inventory items to be found. The challenge often comes from finding the right people to give you the bit of information that will unlock a new location. Edgar will also find himself in need of gaining entry to different buildings or trying to pry information out of certain characters. During a significant portion of the game, it should be relatively clear what Edgar needs to do in order to proceed. You will not find mind-bending challenges that will stump you for days. Carte Blanche keeps the puzzles very simple. Experienced adventurers should breeze through the game. However, there are several times in the adventure where it is not all that clear what you are supposed to do next. Without so much of a hint of which character might provide some guidance, you are left to wander around the city, hoping to eventually stumble onto something that will advance the plot. Thankfully, this does not happen too many times and does not detract significantly from the experience. The first episode of Carte Blanche certainly has some flaws. The atmosphere is unusual, characters are downright weird, and conversations are strange. But the game does not always maintain a balance between its supposed absurdity and humorous tone, leaving players distanced and confused. It is hard to figure out what you are supposed to be doing from time to time. The conversations are not always structured well and the voice acting leaves something to be desired. Yet Carte Blanche deserves credit for attempting something original. The skill system brings some depth and makes for a number of interesting situations. There is promise of an intriguing greater plot that will hopefully unfold in future episodes. Its style and atmosphere will not appeal to the tastes of every gamer. But if you are looking for something that is a little different from your average adventure game, For a Fistful of Teeth does have a few things to offer. If the developers manage to improve upon significantly weak elements of the first episode, the series can still be quite successful.